﻿ Windward has a long tradition of building wooden boats, launching video's. Windward has a long tradition of building wooden boats, launching video's. Launching a new sloop is a big festivity. Many hands take part in the moving from land to sea. Windward is the last traditional boat building village. Guides » Wooden work boat building in Windward. Windward and the boat building tradition. Windward has a long tradition of boat building. Grenada was returned to the British in 1783 after the Treaty of Versailles. Many plantation owners on Grenada and Carriacou wished to import goods into the United Kingdom and elsewhere in the West Indies. Trading vessels were few and far between. So Scottish shipbuilders settled in what is now Windward to build trading sloops and schooners. Wooden sloops being built in Windward. 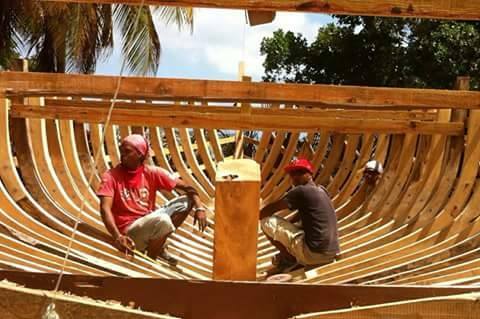 Carriacou Boat Building on video. Walking through the cemeteries in Windward confirms this, as all the headstones are Andrews, McLawrence, Roberts, etc. The village of Windward in watering bay is a quiet one, almost a ghost town. Its population is around 1,000 Kayaks (patois for the inhabitants of Carriacou). The streets are lined with bright flowers that compliment the old gingerbread houses behind them. Tradition re -Launched in Carriacou. Nothing about the boats has really changed in centuries, except for the goods carried and their destinations. Rum may or may not still be smuggled on these ships; I won’t speculate. These boats are still built in Windward using the same methods, though in smaller numbers. Wood is sourced from Carriacou and Grenada and cut using axes and hand saws. Planed by hand, except for the planking. Everything is measured with the trusty eyeball method. One of the traditional hand-built boats of Windward. This one a fishing boat as is obvious from the pilothouse. On launch day, the entire island comes to Windward to participate in the party and the blessing. This boat was built with all the tradition and passion that is left in the Caribbean wooden boat movement. There is only one island left in the Caribbean building these amazing sailing “work boats”. An enormous cookout feeds everyone throughout the day and the only rum that is spilled on the ground is the rum offered up by the priest to appease their shipbuilding ancestors. The boat, built on the beach, slides into the water and will anchor there until its first passage. Boat building at Windward. at 0.05 km. Traditional house made with shingles. at 0.20 km. Path to Petite Carenage beach. at 0.54 km. L’Apelle point north Carriacou. at 0.60 km. Petite Carenage Beach in Windward. at 0.81 km. Watering Bay in Windward Carriacou. at 0.87 km. The cemetery in Windward. at 0.92 km. Windward wrecks. at 0.93 km. Previous: L’esterre and paradise beach on Carriacou.